Introduction – HIV (human immunodeficiency virus) is a lentivirus(a subgroup of retrovirus) that damages the cells in your immune system (especially CD4+Tcells) and weakens your ability to fight infections and disease (1). 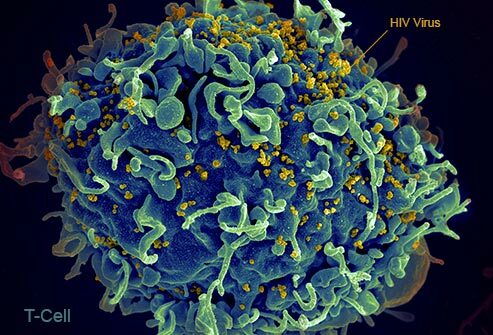 Two genetically different but related to forms of HIV, called HIV1 and HIV2 have been isolated from patients. HIV1 is the most common type associated with AIDS in the United States, Europe, and Central Africa, whereas HIV2 causes a similar disease principally in West Africa (2). AIDS (Acquired Immunodeficiency Syndrome)was first recognized as a distinct entity in 1980 (2). It is a disease caused by HIV and is characterized by profound immunosuppression that leads to opportunistic infections, secondary neoplasms, and neurologic manifestations (2). Statistics – It is estimated that 36.9 million individuals worldwide are affected (3). Of this 2.1 million are children(<15 years) (4). About 70% are in Africa, 10% in Asia, 9% in America, 6%in Europe, and 4% in Western Pacific. More than 25 million deaths are attributable to HIV/AIDS, with 1 to 2 million deaths annually (2,3). Modelled estimates show that new infections (all ages) declined from a peak of 3.4 million [2.6–4.4 million] in 1996 to 1.8 million [1.4–2.4 million] in 2017 (5). The annual number of global deaths from AIDS-related illness among people living with HIV (all ages) has declined from a peak of 1.9 million [1.4–2.7 million] in 2004 to 940 000 [670 000–1 300 000] in 2017 (5). The latest data from countries show that reductions in deaths due to AIDS-related illness—largely driven by the steady scale-up of antiretroviral therapy (5). 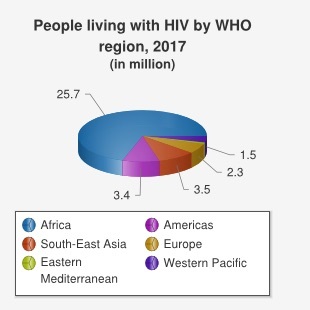 Figure 2 shows statistics of people living with HIV by WHO region, 2017(in million) Image adapted from (4). Diagnosis and medications – HIV infection is identified either by the detection of HIV-specific antibodies in serum or plasma or by demonstrating the presence of the virus by nucleic acid detection using polymerase chain reaction (PCR), p24 antigen testing or, rarely these days, by growing virus in cell culture. Antibody testing is the method most commonly used to diagnose HIV infection. With the highly sensitive HIV-1/HIV-2 enzyme immunoassay (EIA) tests currently on the market, seroconversion can be detected within two to three weeks of infection in the majority of cases (6). All HIV diagnostic laboratories should confirm repeatedly positive EIA screen tests with another assay (6). The Western blot – the most commonly used confirmatory test – is a highly specific immunoblot that allows for the visualization of antibodies to the structural polypeptides of HIV (6). There’s no cure for HIV/AIDS, but many different drugs are available to control the virus. The current standard treatment for HIV infection is long-term use of antiretroviral therapy (ART), a daily regime of drugs that block steps needed for viral replication. If ART treatment ceases, it leads to a phenomenon termed viral rebound(virus becomes detectable in the bloodstream within days,) that can lead to progression towards AIDS. Unfortunately, ART is not the answer for a cure because the drugs do not kill infected cells in the viral reservoir4, which is established when virus inserts its genome into the genome of a host immune cell (7). Non-nucleoside reverse transcriptase inhibitors (NNRTIs) turn off a protein needed by HIV to make copies of itself. Examples include efavirenz (Sustiva), etravirine (Intelence) and nevirapine (Viramune). Nucleoside or nucleotide reverse transcriptase inhibitors (NRTIs) are faulty versions of the building blocks that HIV needs to make copies of itself. Examples include Abacavir (Ziagen), and the combination drugs emtricitabine/tenofovir (Truvada), Descovy (tenofovir alafenamide /emtricitabine), and lamivudine-zidovudine (Combivir). Protease inhibitors (PIs) inactivate HIV protease, another protein that HIV needs to make copies of itself. Examples include atazanavir (Reyataz), darunavir (Prezista), fosamprenavir (Lexiva) and indinavir (Crixivan). Entry or fusion inhibitors Tblock HIV’s entry into CD4 T cells. Examples include enfuvirtide (Fuzeon) and maraviroc (Selzentry). Integrase inhibitors work by disabling a protein called integrase, which HIV uses to insert its genetic material into CD4 T cells. Examples include raltegravir (Isentress) and dolutegravir (Tivicay). Figure 3 – Targeting HIV. a. When a person is infected with HIV, the protein En on the viral surface can bind to receptors on immune cells called CD4+ T cells. This interaction enables the virus to enter the cell, undergo DNA synthesis using the viral RNA template, and become inserted into the host-cell genome. Cells that are actively making virus using these inserted copies of viral DNA are called the active viral reservoir, and virus particles are released from such cells after viral replication. However, some cells that have viral DNA insertions might be in a ‘dormant’ state that does not actively produce virus and instead forms what is known as the latent viral reservoir; these cells might give rise to virus production in the future. b, Bar-On et al.3 report the results of a clinical trial that tested whether the introduction of two antibodies, 3BNC117 and 10-1074, which are a type of antibody known as a broadly neutralizing antibody (bNAb), can lower the blood levels of HIV in people who haven’t received HIV treatment. The two antibodies bind to separate sites on Env, and prevent the virus from binding and infecting immune cells. c, The standard treatment for HIV infection is known as antiretroviral therapy (ART) and consists of a daily dose of drugs that block steps in viral replication. d, Mendoza et al.2 report a clinical trial that tested whether 3BNC117 and 10-1074 can lower virus levels in the bloodstream of people who temporarily stop receiving ART. The results of both studies are encouraging, indicating that the use of two bNAbs can lower virus levels for a time. Image adapted from (8). Latest research – Antibodies are large Y shaped glycoproteins, produced mainly by plasma cells in response to antigens(invading foreign particles) such as microorganisms and viruses. There are five classes of antibodies(or immunoglobulins): IgA, IgG, IgM, IgE, and IgD, according to their Heavy chains, which provide each isotype with distinct characteristics and roles (9). The discovery of some highly potent antibodies, called broadly neutralizing antibodies, helped the idea of the binding of HIV-targeting antibodies to a protein on the viral surface called Env (needed for HIV entry into host immune cells called CD4+ T cells), and blocking it. The use of individual bNAbs as clinical treatments for HIV, have already been tested. They have shown safety and well tolerance. The administration is needed only every few weeks to maintain constant bNAb levels in the bloodstream and in tissues. The previous tests of individual effects of two bNAbs-either 3BNC117 or VRC01- showed a suppression of HIV level in the bloodstream for 6-10 weeks, but then rapid rebound viraemia occurred, and the studies reported the presence of antibody-resistant viral variants(7). Mendoza et al. and Bar-On et al. 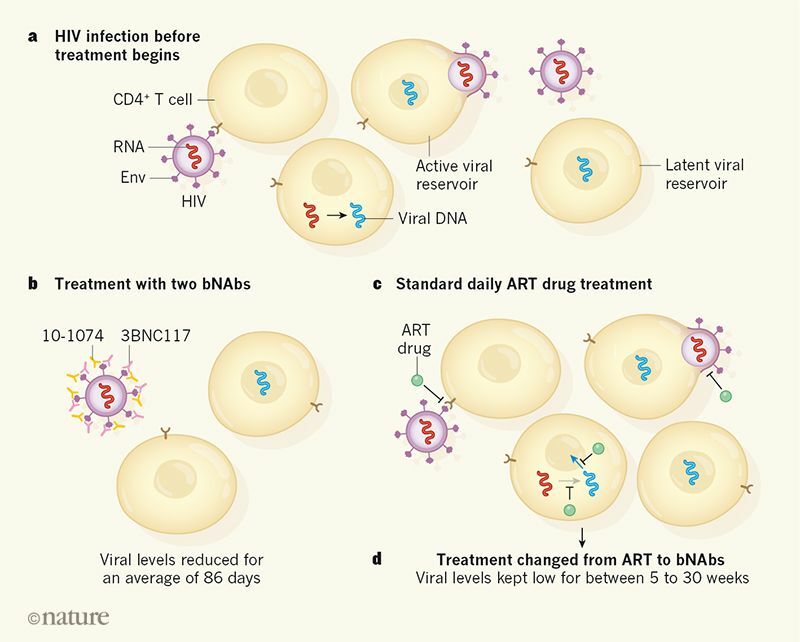 carried out phase Ib clinical trials (small-scale trials to test the safety of a treatment) to find out if combining two bNAbs (3BNC117 and 10-1074) that target distinct sites on Env might decrease the probability of virus resistance occurring, and might control virus levels in HIV-infected people who did not receive ART during the trial period. Mendoza and colleagues assessed the effect of giving the two antibodies to 11 people who were temporarily stopping ART. Bar-On and colleagues analyzed the effect of these two bNAbs on seven people who hadn’t yet received ART Impressive results came from both studies. The bloodstream HIV levels compared with levels at the beginning of the trial underwent reduction. Viral rebound took many weeks to occur, and when it did there was little or no evidence of viral resistance to both bNAbs.Mendoza and colleagues observed that resistance to 10-1074 developed more rapidly than that to 3BNC117. That can happen because of the difference of half-lives between two bNABs. If the dosage of bNAbs could be adjusted so that the half-lives were more closely matched, the development of treatment-resistant viral variants might be avoided. In Bar-On and colleagues’ study, the use of two combined bNAbs showed suppression of virus levels in the bloodstream for 86 days, about 60 days difference (more) after treatment with just one HIV-targeting bNAb.Mendoza and colleagues used an in vitro quantitative virus-outgrowth test to assess the viral-reservoir size. The viral-reservoir size remained the same before and after bNAb treatment. However, following studies might be needed to establish definitively whether bNAbs affect the viral reservoir (7). It is very motivating to know that bNAbs could provide a very useful weapon in fighting HIV. COPYRIGHT: This article is the property of We Speak Science, a non-profit institution co-founded by Dr. Detina Zalli and Dr. Argita Zalli. The article is written by Veton Guraziu (University of Prishtina, Kosovo). 3.Vinay Kumar, MBBS, MD, FRCPath, Abul K. Abbas, MBBS, Jon C.Aster, MD, PhD, Robbins basic pathology,Diseases of the immune system, Acquired Immunodeficiency Syndrome pg.173, 174, 175, 176, 177, 10 th edition, Elsevier. Next articleDefective DNA repair system causes chaos in the genome!